GR5 Titanium Forged Ring produced as per ASTM B381, and carry out NDT test ( Included: Ultrasonic testing, visual surface inspection, Dimensional inspection ) , Titanium forged ring have feature of high properties, low density and corrosion resistant ability. 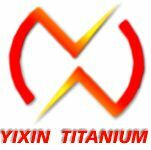 Titanium have a wide use in medical, oil & gas industry, deepwater oil and shipbuilding industries, power industry, metallurgical industry, light industry, chemical industry. Looking for ideal Titanium Alloy Forgings Manufacturer & supplier ? We have a wide selection at great prices to help you get creative. All the ASTM B381 Gr5 Titanium Forged Ring are quality guaranteed. We are China Origin Factory of Titanium Alloy Forged Ring. If you have any question, please feel free to contact us.